US researchers have created the world's smallest computer.. US researchers have claimed to create the world's smallest computer The device named 'Michigan Micro Total' is just about 0.5 millimeter in size. The researchers believe that it will open up new possibilities for cancer monitoring and treatment. A news report from The Indian Express said that earlier researchers had created a device by 2 by 4 by 4 mm. It could keep the information out of the power when it was stopped from outside. But in the case of the smallest computer, once the charge is over, all previous information is deleted. Professor David Blau of the United States Michigan University said, "We are not sure whether it can be called a computer. It depends on the opinion. It is a matter of opinion whether or not there is a function to be in the computer. This computing device with RAM and photovoltaics has a processor, wireless transmitters and receivers. Since it does not have conventional radio antenna, it transmits information with visible light. A base station provides light and energy for the program and receives information. David Blaw said the challenge to create 'Michigan Micro Total' is to make the system packaging transparent, how it can be run in less power. To overcome this problem, new circuits have to be designed. It is made as the perfect temperature measurement sensor. The new device can convert the temperature to electronic vibrations. In this process, the machine can accurately calculate the temperature fluctuations in the cells. 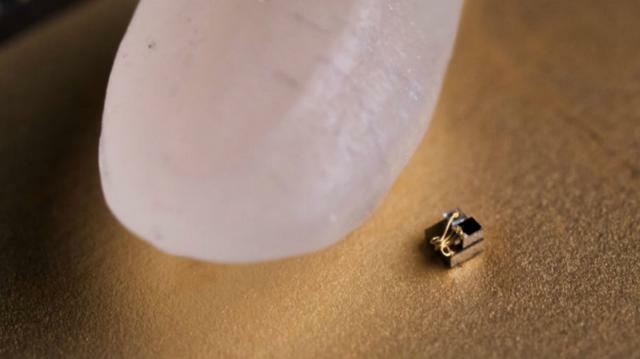 Researchers are planning to use this small micro computer for other purposes. ITInfoWorld.org: US researchers have created the world's smallest computer..